Bring all the popcorn in the world… the number 31 seed, Yulia Putintseva will play Jelena Ostapenko in the second round of the Australian Open on Thursday. Putintseva had a challenging opener on Tuesday, saving ten (!) set points to beat Lara Arruabarrena, 7-6(7) 7-6(10). Putintseva saved six set points in the first set and another four in the second set. Putintseva was clutch down set points in the first set tiebreak, saving one of them with a risky return that was plum on the line. The Kazakh player recovered from 2-5 down in the second set and overcame what seemed to be a leg complaint. The Spaniard played some classy tennis in the tiebreak to get within one point of forcing a deciding set but twice double faulted up set point. Both players lost their focus at times but it was Putintseva who played the big points better and came away with the straight sets win, producing a neat wrong-footing winner on match point. Her reactions during the match were peak-Poots (see below). Ostapenko ended 2016, her first full season on tour, with six consecutive losses including one to Putintseva (more on that to come!). Ostapenko has come back in 2017, refreshed and rejuvenated. She reached the semi-finals of her first tournament in Auckland (where she was forced to retire in the third set to eventual finalist, Lauren Davis due to a viral illness) and won her first ever main draw match at the Australian Open on Tuesday. From a slow start, Ostapenko came back from 1-3 down in the first set and won the last nine games to post a confident 6-4 6-0 victory over Zhu Lin. Head-to-head record: In their only previous match, Putintseva saved a match point to win in the first round of Beijing last year, 6-1 3-6 7-5. The match was memorable for the final moments as Putintseva celebrated the win as only Yulia Putintseva would (see below). Interesting stat: Ostapenko hasn’t beaten a top 50 player since Eastbourne last year where she overcame the then world number 31, Daria Kasatkina. Final thoughts: This match could be a shining beacon of glorious drama. In terms of tennis, it shouldn’t be bad also! While Putintseva prevailed in their most recent encounter, Ostapenko should have won that match. There were many occasions in 2016 where Ostapenko *should* have won matches from winning positions but couldn’t get across the finish line. It’s early days for the 2017 season but Ostapenko looks sharp, both in her groundstroke game and her mental application. Putintseva will likely throw the whole caboodle at Ostapenko with her array of variety and hotshots. 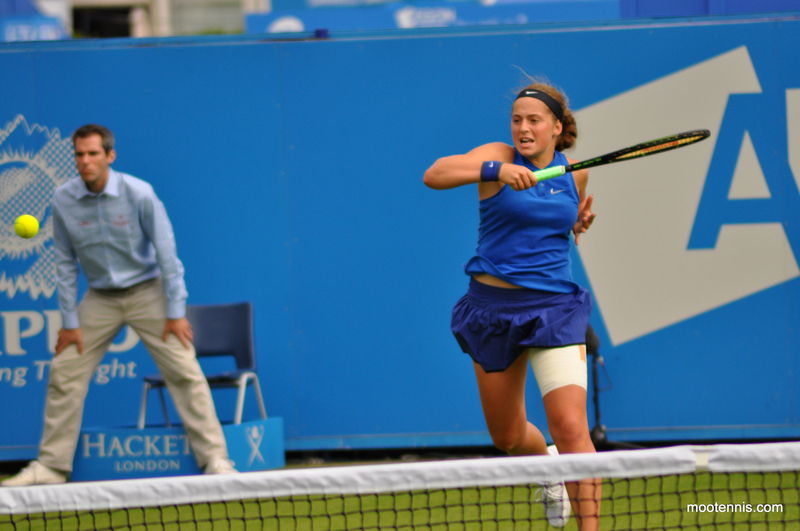 However, this time round i’d fancy Ostapenko to convert on a match point. January 17, 2017 in Australian Open, Ostapenko, Putintseva, WTA. ← Tuesday’s Set Points, Australian Open 2017 Day 2: Serena starts strong, Lucie saves 9 match points! Both of these have fiery personalities. Pity I cannot watch it as it might be entertaining and interesting even if the tennis is not particularly good ! I have gone for Ostapenko to edge it. I’m going to attempt to get up for it at midnight but it will be a struggle!